From Ruth Gilstrap of Mitchell, Indiana on 3/16/2019 . These are one of a kind pickles! The taste is different and refreshing. 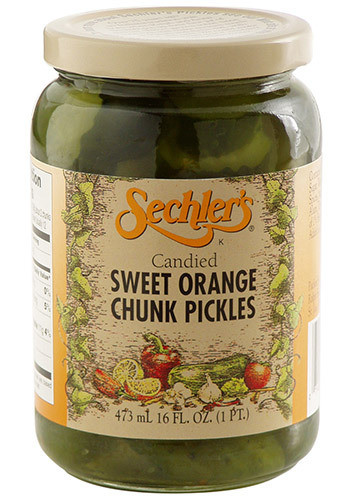 I love Sechler's pickle no matter what kind because they are always of the highest quality. From E. A. Tyson of Manistee, Michigan on 1/31/2019 . Excellent!! Excellent!! Did not order enough. From Evelyn Bourland of Albuquerque, New Mexico on 11/30/2018 . Ordered these for my sister as we remembered when our Granny use to buy these 40 years ago. They were as delicious as we remembered. Shipping was extremely fast! From Anonymous of Starkville, Mississippi on 10/5/2017 . They handwrote my special message to my special girl! Who does that? 10/10 would recommend. From Michael S of Fort Dodge, Iowa on 12/30/2016 . Great tasting pickles that were shipped & delivered before Christmas on short notice.